Whitewater rafting can a fun, family-friendly activity if you choose your tour carefully, says Penny Bunting. But be prepared to get wet! 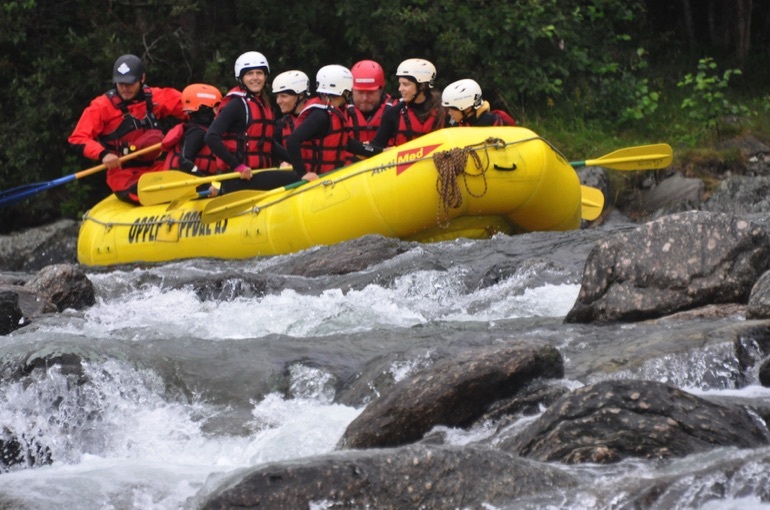 Whitewater rafting is a classic bucket list activity. 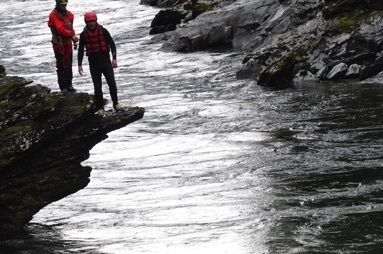 Hurtling along a fast-flowing river offers an adrenaline-pumped adventure of thrills – and, inevitably, spills – that has just enough threat of danger to make it really exciting. 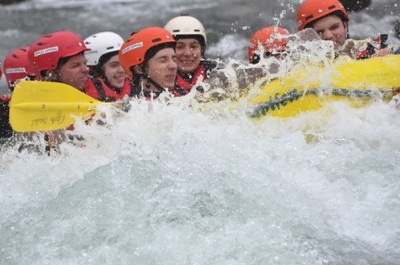 While, for many, that sense of danger is the main incentive for taking to the rapids, there are just as many who would love to experience the thrills of whitewater rafting – but without the spills. If you have adventure-seeking kids in tow – or (like me) you're just a bit of a wuss – there are gentler options available. 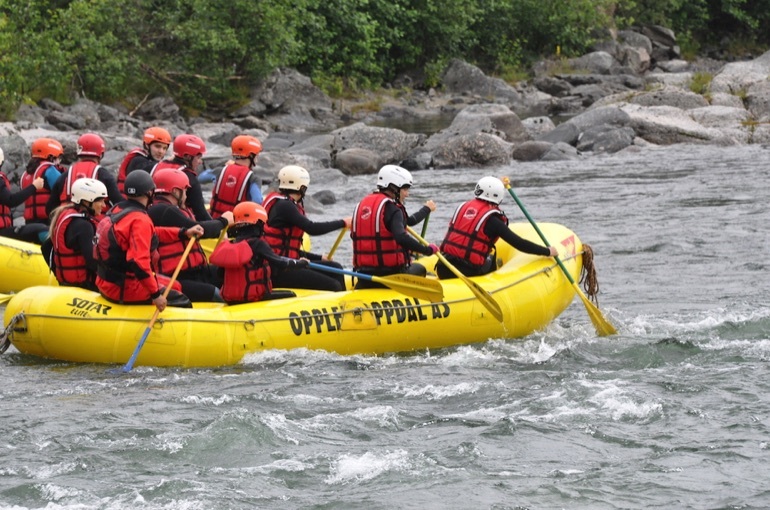 Opplev Oppdal, in the stunning Dovre region of Norway, offers a family-friendly rafting experience that's perfect for older kids. 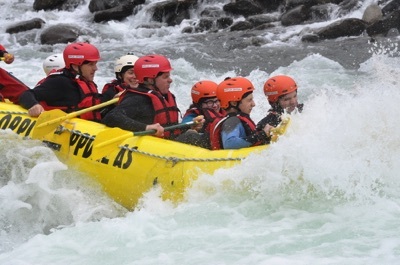 Or, if you just want to give whitewater rafting a try to see if you like it, it's a superb introduction before taking on a more challenging route. The Family Tour is a shorter and gentler version of Opplev Oppdal's Grade 2-4 Normal Tour. It takes around two hours, and covers a distance of 4km. Our whitewater rafting adventure started just south of the ski resort town of Oppdal. 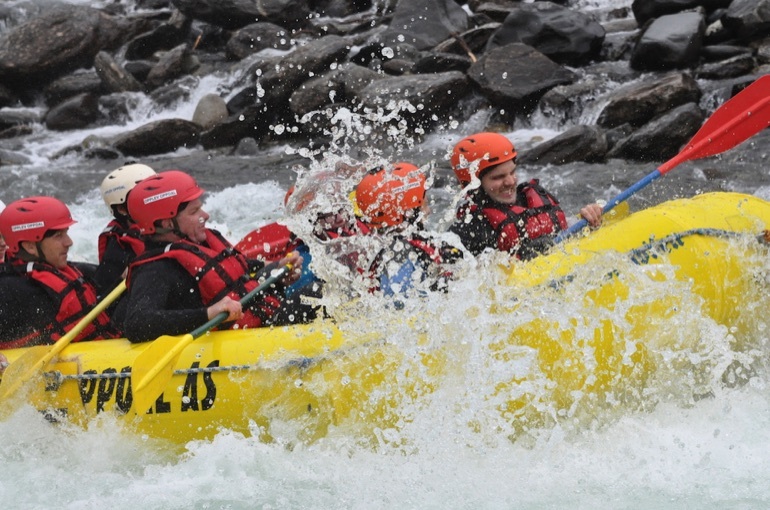 The Family Tour heads through the beautiful Driva river valley – this is a less famous rafting destination than the Sjoa river further south, but no less wild, beautiful or challenging. After getting kitted out with wetsuits, life jackets and helmets – as well as waterproof gloves and socks to keep out the wet and the cold – we were transported by minibus to the launching site on the riverbank. Here, our two teams of eight adults and children were given a thorough safety briefing – including a warning about all the injuries we might incur if we didn't follow the safety procedures. “But don't worry,” our guide, Tammy, said reassuringly. “On the normal and expert routes, someone nearly always falls out of the raft. On the Family Tour, that hardly ever happens”. 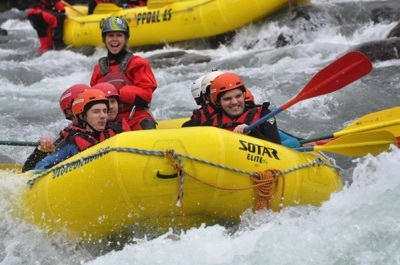 Whitewater rafting involves perching on the side of a large inflatable dingy while you ride the river current – including a series of rapids – downstream. Between rapids you paddle furiously, working as a team, to keep the dinghy heading in the right direction, and to avoid any rocks. On entering each section of rapids, your guide yells “Get down!” and you sit in the base of the boat while it hurtles through swirling, cascading water and huge crashing waves. And, of course, you get very, very wet. 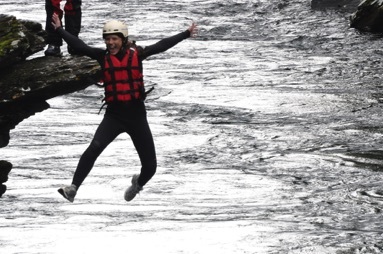 In a bid to prove Tammy wrong, on the very first set of rapids I nearly fell out. I was too busy smugly watching the other team, who had managed to get stuck on the rocks that our team had just successfully manoeuvred around, and at Tammy's “Get down!” my reactions just weren't fast enough. Luckily for me, the reactions of my teammate – a Norwegian guy who had done this many times before, and for whom this little excursion was just a float in the park – were much faster. He grabbed my arm and pulled me swiftly into the boat. Needless to say, at the next “Get down!” I was down and into the boat like a shot. There were several sets of rapids on the Family Tour, and each set increased slightly with difficulty – and associated thrills. Between rapids we cruised along calmer, deeper waters. While these sections of the trip lacked the heart-thumping excitement of riding the rapids, they were thoroughly enjoyable. The scenery was spectacular, with the high mountains of the Dovrefjell National Park towering in the distance and the wild beauty of the river valley surrounding us. Wildlife abounds in the region, with the possibility of seeing reindeer, elk and golden eagles. The extraordinary, elusive musk ox also lives in the high fells of the national park and can be seen during a guided safari from Oppdal – although Tammy told us she was once lucky enough to spot one while rafting on a higher stretch of the Driva. Wherever the water was deep enough, we were encouraged to jump out of the boat for a swim. Although this was mid-summer, the water was freezing – and as we hit the water, the initial shock left us breathless. 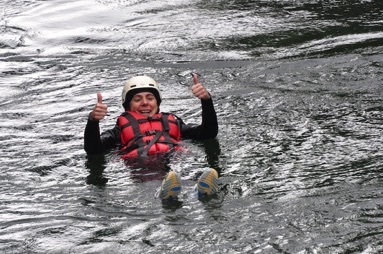 But after acclimatising to the cold, we enjoyed the fantastic and fun sensation of clinging tightly to a rope whilst floating behind the raft as it sped downstream. In the quieter stretches of the river we also played some games. There were splash attacks on the team in the other boat, and a competition to see who could walk the furthest around the sides of the raft before falling (or being pushed) in. We also all stood up and paddled frantically to make the raft spin round and round, while Tammy shouted encouragement. After the final and most exhilarating set of rapids, we landed the boats at the water's edge. But the adventure was not yet over – there was one more challenge to face. A rock outcrop towered over this section of the river, and we were invited to jump off it into the raging torrent below. We took turns to clamber up the rock and peer down at the river – which seemed an alarmingly long way down – before, quite literally, taking the plunge. This was, perhaps, the best bit of the tour. After leaping into the deep, cold water we floated downstream on our backs – a sublime experience. This was a wonderful finale to our trip, and we returned to Oppdal cold, wet and exhausted – but with a real sense of achievement. 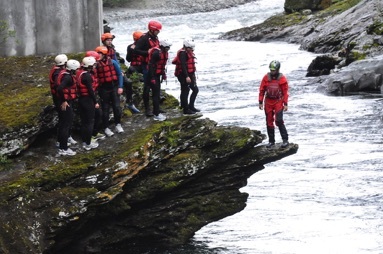 The Opplev Oppdal guides were knowledgeable and made us feel safe throughout – and yet they approached each aspect of the trip with a sense of fun, making the whole experience highly memorable. It was a superb introduction to whitewater rafting – and next time we will have the confidence and skills to tackle a more challenging route. Oppdal is the obvious base for a whitewater adventure in the Driva Valley. The town has a good range of hotels and restaurants for all budgets, as well as great selection of shops. We stayed at Quality Hotel Skifer. 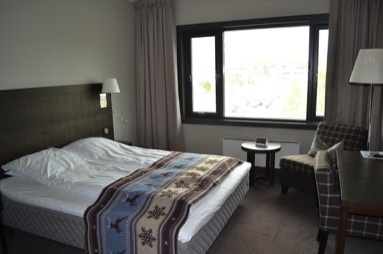 Although this is a large, modern hotel conveniently situated in the centre of town, it manages to create the atmosphere of a cosy mountain retreat, with dark wood, snug seating areas, and candles on the dining tables – even in summer. The hotel's distinctive facade is built from local slate and there is a theme of natural materials throughout the hotel – with stone, wood and wool combining to create a warm and welcoming ambience. The guest rooms are lovely. Decorated in natural, soothing colours, they are modern and comfortable – and many have fantastic mountain views. Soft, woollen throws, adorned with reindeer and snowflakes, keep things cosy. There are interconnecting rooms that are perfect for family groups, with free wifi and flatscreen TVs providing entertainment. 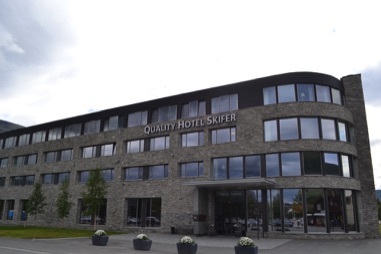 Quality Hotel Skifer is part of the Nordic Choice chain, which has an impressive raft of environmental and sustainable policies that go far beyond the “Please re-use your towel” mantra found in many hotels. These planned and monitored initiatives have produced excellent results, with the environmental impact of Nordic Choice hotels dramatically reduced – for example, a 41 per cent reduction in use of chemicals and a 45 per cent reduction in non-recyclable waste – with plans in place to reduce impact further year on year. Electricity throughout 80 per cent of the chain uses 100 per cent renewable energy, while low-flow jets in toilets, sinks and showers are being installed to reduce water consumption. Sustainable food is of great importance too: organic and locally produced food is used in breakfast buffets, food waste is avoided and alternatives to meat – including plenty of fresh and healthy fruit and vegetables – are readily available.